does anyone know the torque specs for the front caliper bracket bolts and slider pins on a 2003+ 4wd ranger? maybe the size of the wrench used as well? im thinking it is 13mm and 15mm but i cant remember. Im writting a "how to paper" on changing pads and rotors. aaron (redakranger) did a how to on 4wd rotor changes. Maybe that would help...I seen a post in there from Bob on torque specs of something or other. i've never torqued thoes bolts, always just got them tight. thanks guys i knew someone did it. i need to make it more extensive though as it is instructions for a "novice" user. Im basically done just need a few numbers. If ppl can't figure that out they should just go to a garage. Brakes aren't something you wanna f* around with if you're clueless. Ive made the process more complicated then that and went through every step. heck ive got a page and a half of instructions typed in word. Good luck on it though. Add a disclaimer for sure!
" im not responsible for ANYTHING that happens period"
Now the brake caliper bracket is what I am not sure of. 106 Nm - 78 lb-ft is what is listed for Front axle retainer bracket bolt, not sure what ford is calling the caliper bracket. Most of you guys I'm sure are into your trucks for fun or just driving to work. I use mine for delivering mail. I've put on about 90K miles on it so far and this is the easiest way. I carry a 1/2 inch drive ratchet and a 1/2 inch drive socket to fit the bolts. A 6inch C clamp, and I use something to put over the caliper pistons like a spackle tool or thin metal plate so the C clamp can rest on it, once I remove the caliper off the rotor. Take the C clamp and screw down the pistons then put the caliper back on the rotor after you've put on the new shoes. I'm not sure when Ford finally got the idea to match the inner and outer shoes, but my '01 is like that. I keep the old shoes (outer ones always have a lot of wear left) for emergencies when the inner pads start grinding metal. (We drive up to 150 miles daily, so it can happen, especially stopping over 1000 times a day). It takes me about 20 minutes to change them---almost as fast as changing a tire. Also best thing they ever did was getting rid of those stupid caliper pins. 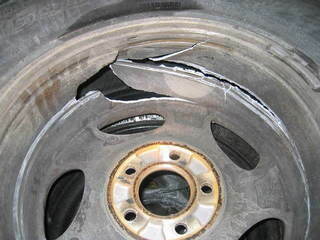 Mine wore out after about 3 brake changes. And you had to get the right brand or they wouldn't fit right and the calipers would rattle. The caliper anchor plate bolts are torqued to 85 lb-ft. The caliper slide pin bolts are 24 lb-ft. These bolts must be correctly tightened to the above specs using a torque wrench. The torque on the anchor bolts in particular is much higher than you might guess by "feel". In addition, the anchor bolts must be replaced or the threadlocker must renewed each time they are disturbed. However, no amount of threadlocker will compensate for an undertorqued fastener. If you don't have a torque wrench or don't know how to use it correctly, you should not be working on anything important on your truck. Several people on this forum have reported caliper anchor bolts falling out after doing brake jobs. Bob you have to be the smartest person I know I mean I have not seen a question you have not anwsered! And yea, make sure you get them tight or you'll end up like me. Havinf your caliper fall off the rotor while driving down the road. Sorry if it sounds like hillbilly mechanicking here. But I've never in 15 years had a caliper fall off my wheels. I wore the shoes down to metal to metal many a time and wore out rotors and calipers, but never had that problem. I've even had tie rod ends fall off on me and wired them up with coat hangers to make it back to the office. But not calipers. I have heard of it happening know people its happend to but it has not happend to me yet. Ok, stand corrected. Can't help that I never had it happen to me, though.